Stubborn centuries from Alastair Cook and Jonathan Trott helped England battle back on day three of the second Test against Sri Lanka in Cardiff. After rain delayed play until 1400 BST, the early wicket of nightwatchman James Anderson united Cook and Trott at the crease at 47-2, still 353 runs behind. But the pair showed patience initially and then exerted their authority. 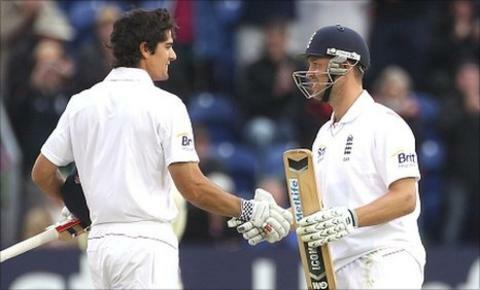 Cook ended the day on 129 not out, with Trott unbeaten on 125 to leave England 287-2, trailing the tourists by 113. It was far from scintillating viewing, but the dominance of Cook and Trott for much of the day helped England wrestle control of the game away from Sri Lanka after they had posted 400 and then claimed the scalp of home captain Andrew Strauss late on Friday. The 240-run partnership between the opener and number three - the highest for England against Sri Lanka - brought back memories of the recent Ashes tour down under, during which the pair were dominant at the crease amassing 766 and 445 runs respectively in the series. Cook picked up seamlessly where he left off from the 189 he scored in the fifth Test in Sydney, holding the tourists' attack at bay before beginning to impose himself on an increasingly flat wicket. As usual, Trott was the perfect foil - never flustered, always controlled - and at no stage in the day did he or his partner look like sacrificing their wicket unneccessarily. Equally, the Sri Lankan bowling attack did little to suggest they had the tools to get them out. Ajantha Mendis was initially economical without being incisive, fellow spinner Rangana Herath ordinary, while seamers Suranga Lakmal, Thisara Perera and Farveez Maharoof were completely unthreatening. What new captain Tillakaratne Dilshan would have given to still have the recently retired world record wicket-taker Muttiah Muralitheran or unorthodox paceman Lasith Malinga still at his disposal. However, with scans revealing a grade one side strain to England's attack leader James Anderson, which will curtail his involvement with the ball for the remainder of the Test, it remains to be seen if they have the firepower to press for an unlikely victory. Despite not being able to bowl, Anderson's nightwatchman duties from the previous day meant he was required to face the first ball of the day - three hours later than expected after an early lunch following persistent morning showers. Anderson was not expected to shoulder the burden of England's fightback from a 353-run first innings deficit, but even he will have been disappointed not to have added a run before an erratic and brief cameo was brought to an end when he edged one to Mahela Jayawardene off Ajantha Mendis. Anderson's replacement Trott is not a flowing batsman at the best of times, but with the Sri Lankan bowlers - Mendis in particular - giving little away, he and Cook laboured for the first hour of their partnership. Slow it may have been, but Cook was the epitome of authority as he brought up his half-century from 112 balls, to guide England towards 100. Cook is accustomed to occupying the crease, having batted for an England record of 1,022 minutes without being dismissed during the tour down under, and he found a more than capable cohort in the shape of the stubborn Trott. The pair brought up their 100 partnership from 176 balls, on the last ball before tea, forcing Trott to wait to reach his fifty, which he eventually brought up, shortly after the restart, from 102 balls. The prolific partnership continued and it was Cook who brought up his century first, a remarkable sixth Test ton in the last 12 months, and his 17th overall in the five-day format. It was not long before Trott joined Cook on three figures courtesy of a firmly struck drive for four, his century taking him 196 balls, 39 fewer than his partner. The ton is Trott's fifth in Test cricket in the last 12 months. Even before this innings, the South African-born Warwickshire man was averaging 61.5 in Test cricket. Only the legendary Don Bradman has a Test average higher than this. It was a frustrating day in part, certainly a long one - especially for the Sri Lankan fielders - but nevertheless, one that England entirely dominated.